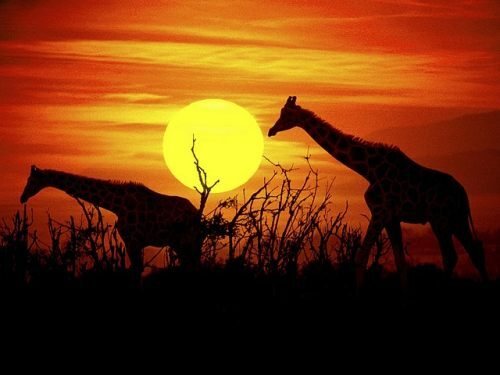 New York (JFK) to Nairobi, Kenya (NBO) - $392 roundtrip including taxes! There's a possible mistake fare showing in some booking systems from New York (JFK) to Nairobi, Kenya for the ridiculous price of $392 (Canadian) roundtrip including taxes on Etihad Airways. With such limited dates, this one will likely disappear very quickly. 6. Click one of the booking buttons to be taken to a third party booking site to complete the booking. 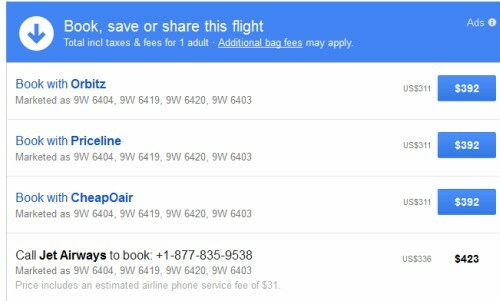 Of the booking partners listed, I would recommend clicking through to Priceline. In the past, they have been one of the best at honoring fares, even when they turn out to be mistakes. No guarantees of course, but mistake fares originating from the U.S. are almost always honored these days, thanks to a law that requires airlines to honor them. The price on Priceline.com is in $USD. It will work out to $392 Canadian when booked. Each direction contains a lengthy stopover in Abu Dhabi. @3:07 PM EST - The prices seem to all be returning in the low $500s now. Live discussion of this deal can be found in the YYZ Deals Facebook Group. Special thanks to Rishi for sharing this great find! toronto, yyz, flight deals, nairobi, kenya, nbo, africa, united arab emirates, etihad airways, east africa, abu dhabi, auh and the middle east. 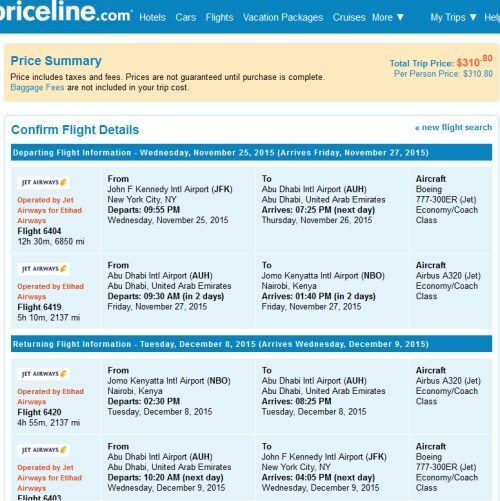 7 Responses to "New York (JFK) to Nairobi, Kenya (NBO) - $392 roundtrip including taxes!" Didn't last. Showing $689 USD now. This seems to be one of those ones that disappears, comes back for a while, and then disappears again. Keep trying different dates and different booking partners. Share what you find!